Summer has officially ended, and so has this year’s Magic City Summer intern program. Findings from the program’s 251 summer interns gave insight about the perceptions of this year’s participants, who were connected not just to the companies they interned with but also to Birmingham. The participants were from 135 hometowns, 21 states and four countries and represented 79 different colleges and universities. 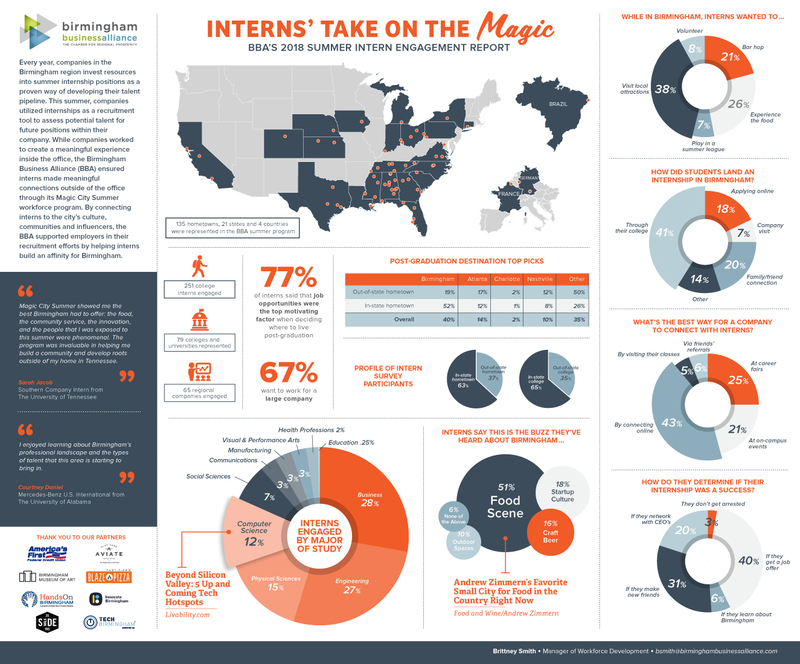 Magic City Summer is a free summer program for interns at companies across the Birmingham seven-county region and part of the Birmingham Business Alliance’s Talent Recruitment Program. The program helps talent build an affinity for Birmingham, which in turn improves employers’ chances of retaining employees. It is a series of free social events that connected summer interns to Birmingham’s culture, communities and influencers. Interns from 65 regional companies were engaged through the program. Business and engineering were the top two college majors most represented among participants in the program. 51 percent of participants said Birmingham’s food scene is what they’d heard most buzz about. While in Birmingham, most of the interns wanted to visit local attractions (38 percent). The best way for a company to connect with interns is online (43 percent). 40 percent said the measure of a successful internship was if a job came from the experience. Over three-fourths of the interns said job opportunities were the top motivating factor when deciding where to live post-graduation from college. That said, it’s not just about getting a job anymore, Smith said. To learn more about the BBA’s Magic City Summer program, visit here.